It’s summer! The arrival of the warm weather coincided perfectly with the first official day of summer and that means Fourth of July celebrations are right around the corner. 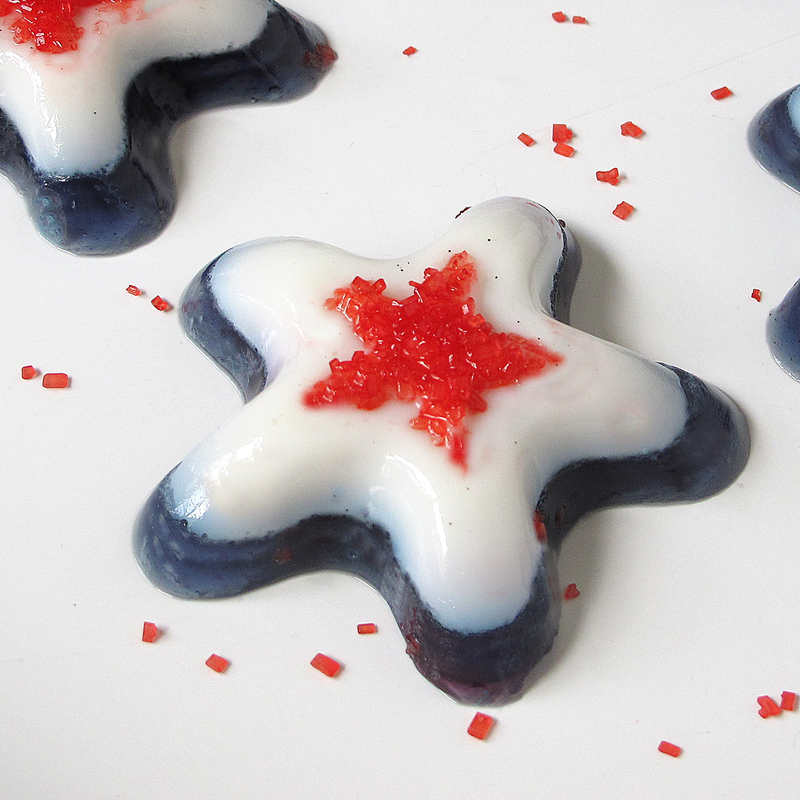 For this year’s rooftop BBQ and fireworks display I made festive Star Spangled jello shooters. Vodka or rum liven up mini jello stars layered with blueberry, vanilla ice cream, and fun sprinkles! Have a happy 4th! In a bowl, sprinkle 1 tablespoon (1 package) of unflavored gelatin over 1/4 cup of the cold water and allow the gelatin to absorb the water. Stir in 1/2 cup of the boiling water until gelatin is fully dissolved. Stir in 1/4 cup of the sugar until sugar is dissolved. Stir in ice cream until mixture is smooth. Spoon into star shaped molds and refrigerate until gelatin is set but not firm (should stick to your finger when touched). In a separate bowl, sprinkle 1 tablespoon (1 package) of gelatin over 1/4 cup of the cold water and allow the gelatin to absorb the water. Stir in 1/2 cup of the boiling water until gelatin is fully dissolved. Stir 1/4 cup of the sugar. Stir in 1/2 cup of blueberry pie filling and 1/2 cup of vodka. Refrigerate until mixture beings to cool and thicken then gently spoon into molds over the ice cream layer. Refrigerate until firm. Unmold, sprinkle with red sugar crystals, and serve.